I have been asked to come and participate in Ethipoa's National New Years Celebration. We will also be holding holding a series of daytime and evening meetings with Pastors from all over Addis Ababa, and with the national intercessors network led by Rev. Samuel Hailu. We value your prayers as we go and would like for you to consider being a part of this important historic short term mission team by considering giving an offering for the cost of this mission trip which is $6,000 including airfare, transfers lodging, meals and we would also like to give an apostolic seed gift to Gospel Light Church. Sep 14 - Arrive in US. Please consider being a part of this short term mission trip by providing an offering to help cover the cost of this short term mission trip including medical supplies and equipment for the IMPACT TEAMS mail your offering to: Living Faith Ministries - 201 Judson St. - Webster, NY 14580, or you can call our offices at (585)738-0777. 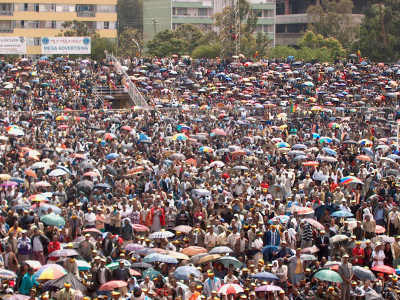 Ethiopia's National Day of of Repentance and Reconciliation March 23, 2003. 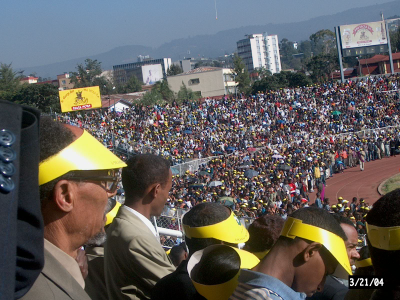 Ethiopia's National New Years Celebration. To help us partner with what God is doing in Ethiopia mail your offering to: Living Faith Ministries - 201 Judson St. - Webster, NY 14580, or you can call our offices at (585)738-0777.